The Chamblee Bulldogs had a great week between the lines with four wins. From media day (l-r) Assistant Coach and Junior Varsity Coach Alan Loper, David Albuquerque, Matt Welsh and Travis Hammond. 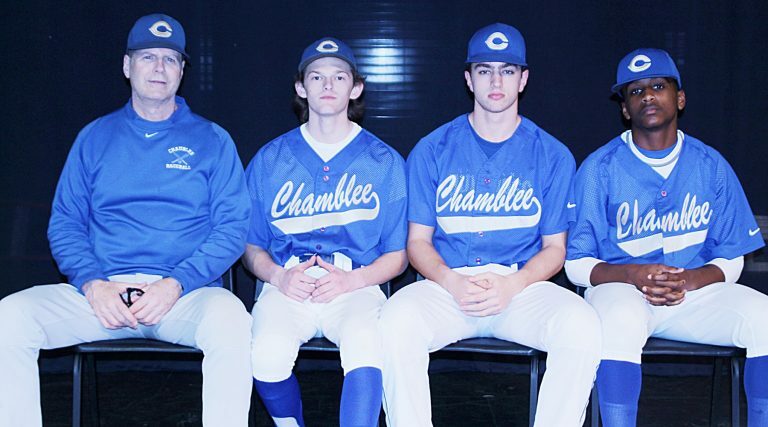 Chamblee led the way among four DeKalb County baseball teams with undefeated records from last week. Coach Brian Ely’s Bulldogs out-scored the opposition by a 33-14 margin in improving to 9-5 overall on the season. Chamblee swept a pair from Berkmar (9-3) March 5 and (6-5) March 9 and also rolled past The Weber School (3-0) March 8 and Shiloh (15-6) March 10. Chamblee received a stellar pitching effort in a 9-3 decision over Berkmar March 5. Senior David Albuquerque went the full seven innings, striking out nine and allowing only two hits and no earned runs. Freshman Isaac Harkins (2-3) and junior Daniel Sedacca (2-3; 1 RS) paced the offensive effort. Junior Max Stephens followed with another stellar pitching performance for the Bulldogs three days later, going seven innings and allowing three hits while striking out three in a 3-0 blanking of The Weber School March 8. Junior Matthew Welsh finished 3-4 with one run scored and one RBI on the offensive end. Albuquerque turned in a monster outing at the plate for Chamblee in a 15-6 pounding of Shiloh March 10, going 4-5 with four runs scored, two stolen bases and one RBI. Coach Terrence Canty’s Miller Grove Wolverines posted a 2-0-1 mark over three games to move to 4-2-1 overall for the year. Miller Grove registered triumphs over Maynard Jackson (4-3) March 5 and South Atlanta (11-0) March 10 to go along with a 5-5 draw with Mt. Vernon March 10. Coach Sylvester Allen’s Towers Titans remained undefeated on the year at 3-0 with an impressive 8-0 shutout decision over Stone Mountain to open Region 5-AAA action March 5. Coach Samuel Marion’s Lithonia Bulldogs also continued to rank among the most improved teams in the county, scoring a 7-6 road victory over Cedar Grove March 10 to move to 4-4 overall on the campaign. Freshman Marvin Booker went 2-4 with one run scored, one RBI, one double and one triple in the victory over Cedar Grove. Clarkston posted a no-hitter in a 7-2 triumph over Meadowcreek March 8. Senior Johnathan Drake went five inning, striking out five and walking three while allowing no earned runs. Senior JaQuan Johnson led the Angora offensive charge, finishing 2-3 with two runs scored, one RBI and one stolen base. Arabia Mountain wasted a strong mound effort from senior Corey King in a 2-1 loss at St. Pius March 5. King allowed five hits and one earned run over 4 2/3 innings and struck out six against three walks. The Rams bounced back three days later to score a thrilling 8-5 triumph over Newton County March 8. Arabia Mountain scored five runs in the final two innings to erase a 5-3 deficit and move to 6-3 overall on the year. King (2-4; 2 RS; 1 RBI; 1 3B), senior Josh Campbell (2-4; 1 RBI) and junior Micah Sanders (2-4; 1 RS; 1 RBI; 2 SB) collected two hits each in the victory, while senior Jordan Sterling walked away with the mound decision while striking out three in two scoreless innings of relief. Junior Tremaine Hill turned in a big offensive outing in Cedar Grove’s 7-6 loss to Lithonia March 10. Hill finished 3-4 with two runs scored and two stolen bases. Druid Hills pounded out 13 hits in a 16-1 decision over Clarkston March 9. Senior Thomas Weingartner (3-3; 4 RBI; 2 RS; 2 2B), junior Brandon Thomas (3-3; 2 RBI; 1 2B) and senior Roarke Cummings (2-3; 2 RS; 1 RBI; 1 SB) shined brightest among the individual offensive leaders for the Red Devils. Junior Ali Desrochers earned the pitching triumph for the Red Devils, starting and striking out two over two scoreless innings. Lakeside romped past North Springs by a 10-3 count March 5, as senior Jackson Mathis put together an offensive outing for the ages to lead the way. Mathis went 2-5 with a homer, double and seven RBI. Senior Charlie Ludwick (2-3; 3 RS; 1 RBI) also collected multiple hits. Junior Nate Yeager snared the pitching triumph for the Vikings, striking out four while allowing six hits and two earned runs over six innings. Sophomore Shane Daley (2-4; 2 RS; 1 RBI) and freshman Joseph Jackson (2-3; 1 RS; 1 RBI) shined at the plate in Stephenson’s 6-1 decision over Forest Park March 5. Senior Ga’von Wray struck out 12 over six innings to gain the mound triumph.